go straight, then turn left at the first traffic light and straight on for approximately 5min. enter Tokyo Port Bowl building at A-entrance. after exiting, take right and then turn right at the first corner. go pass the shrine and take the promenade that goes under the JR railway. turn left and go straight along construction area. turn right at the next corner and turn left at the next. 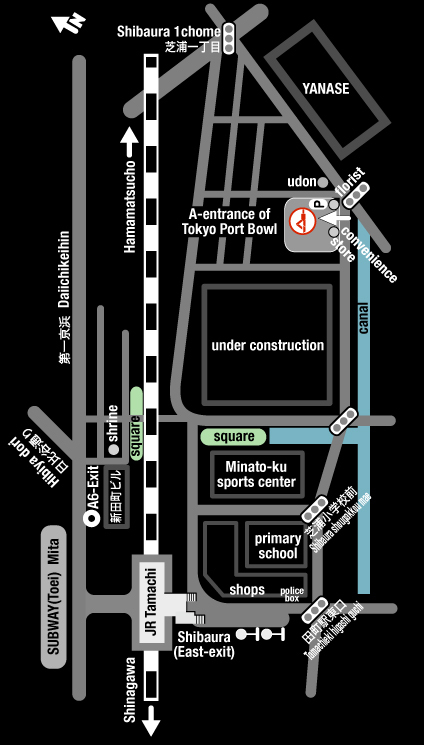 Tokyo Port Bowl will be on your left,from A-entrance.